Running is one of the most common ways to exercise– and for good reason. It’s a great way to relieve stress, enjoy the outdoors, and burn calories. But, if you don’t pay attention to your body’s soreness, the repetitive motion of running can cause severe damage to your muscles, tendons and bones. And, if you don’t treat these injuries, they can quickly worsen, or impact other parts of the body. 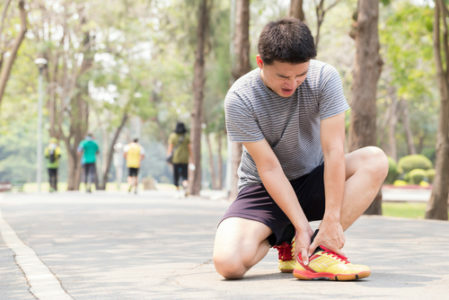 In this blog post, we’ll discuss the most popular sports injuries that runners suffer from, treatments, and ways to prevent them. Aptly referred to as runner’s knee, patellofemoral pain syndrome is one of the most common sports injuries for runners. Despite its popularity, healthcare professionals have been unable to find the cause. This sports injury causes a dull ache in the knee, often toward the front. For many patients, this sensation is especially common when walking up or down the stairs, kneeling, and squatting. Patients that sit with bent knees for long periods are also prone to pain. Runner’s knee is often associated with overuse– which is especially common among the running community. It is also common for people who have suffered from previous knee injuries. For example, dislocations and fractures can make runners more susceptible to this injury. Surgery may also increase the likelihood of this injury. Regardless of these factors, early diagnosis is essential. While there is no treatment that cures this condition in its entirety, there are ways to mitigate treatment. Over time, the pain that stems from this sports injury should reduce in intensity. Pulled, strained or torn hamstrings are all sports injuries that can affect people who are both seasoned and new runners. Spanning the length of the thighs, the hamstrings are prone to injury when they are both very flexible or inflexible. And, runners with very strong quads can occasionally suffer hamstring issues as well. Failing to warm up can also be a factor. Acute injuries– in which runners suffer a sudden, searing pain– require months of rest for proper treatment. On the other hand, people who build up this injury over time may benefit from light jogging– but decreasing the intensity is essential. Generally, resting should speed this process along quite well. Stretching (under the guidance of an orthopedic specialist) is another critical component of recovery, as it restores the range of motion. Shin splints cause severe pain along the tibia, or shin bone. Also known as medial tibial stress syndrome, this condition comprises about 15% of all running injuries. In many cases, people who suffer from shin splints have not trained properly. Runners who dramatically increase the intensity of their regimen, or who abruptly return to running after an extended period of inactivity are the most common patients. Some shin splints may also be caused (or worsened) by the wrong footwear, which can put undue stress on the feet. In order to prevent further injuries, runners who experience this pain should immediately decrease their level of activity. Then, they should decrease the intensity of their running to a more comfortable distance or pace. Stabilizing the various parts of the body involved in running can aid in recovering from shin splints. For example, an ankle brace alleviates some of the stress that is involved in supporting the leg. While not specific to one part of the body, stress fractures are another classification of sports injuries that affect runners. These chronic injuries tend to develop over time, as a result of the stress that this activity puts on the bones. It often affects runners who exercise too often, for too long, or at too high an intensity. After periods of intense exercise, giving your bones time to recover from this stress is essential. This sports injury is more common in women than men. And, people who have been running for a longer period of time are less likely to experience this injury. After a stress fracture, continuing to run could worsen the injury, while also causing pain. This sports injury generally requires 8-16 weeks of rest for a proper and sustained recovery. Continuous weight training might improve your bone density, and prevent future injury. Sprained ankles are one of the most common sports injuries for any activities that require quick, precise movements. As one of the most popular motion-heavy sports, ankle sprains are especially common for runners of all activity levels. When the ankle is forced from its normal position, the ligaments become stretched– which cause it to tear. Often, this results from a twist, an uncomfortable landing, running in an area with uneven surfaces, or any other action that may cause your ankle to be pushed into an awkward position. This is a common orthopedics issue for children as well. People who are just beginning to engage in physical activity are more prone to ankle sprains, as these muscles are not as strong. Running in outdoor settings— such as a trail– may also increase the chances of this sports injury. And, patients who have previously sprained their ankles are more likely to sprain it again. After the injury occurs, it’s important to apply ice periodically, and rest. Then, compressing it with an elastic bandage will reduce swelling. Finally, elevating the injury helps to drain the fluid. An orthopedic specialist can help patients to overcome this injury with individualized physical therapy treatment. This is often supplemented with stretching, light exercises, and more. Very severe ankle pain may be treated with an arthroscopic surgery. Paying attention to your body before, during and after running is absolutely essential. By doing so, you can catch potential injuries before they develop into full-blown problems. Before your injury becomes too severe to manage, you should receive treatment from a Long Island orthopedist. At Central Orthopedics, we can help you to recover from these injuries, and return to your previous lifestyle. Contact us to schedule an appointment with our attentive and helpful staff.